To satisfy guests with a more indulgent party appetite, this swanky club will offer deluxe VIP packages with table and bottle service, reserved seating, priority admission and more. VIP tables are limited. So book early to join a celebration that promises to greet 2019 in a rarefied way. This event will sell out. Motion sensitive LED screens? Room for 1000+ people? Multiple bars? You got it! Lure Nightclub can be compared to the Las Vegas of Los Angeles. 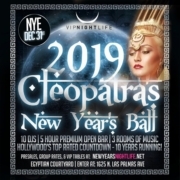 Situated in the heart of Hollywood, this ultra-glam LA top club attracts big name DJs with its massive dance floor and 50,000-watt Line Array sound system. Lure is the place to go for a classic Los Angeles nightlife experience coupled with the frequent celebrity sightings. So don’t forget to dress to impress; you never know who you might meet this NYE. Need help selecting the right party? Still have questions? Our customer experience team is here to help. 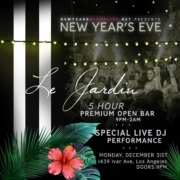 For a spectacular NYE New Years night out, please don’t hesitate to give us a call (310) 749-9029. Includes all GA benefits. 4 VIP tickets. 1 bottle of Premium Liquor + 1 Premium Champagne Included. Includes all GA benefits. 6 VIP tickets. 2 bottle of Premium Vodka + 1 Premium Champagne Included. Includes all GA benefits. 8 VIP tickets. 2 Bottles of Premium Liquor + 2 Premium Champagne Included. Includes all GA benefits. 10 VIP tickets. 4 Bottles of Premium Liquor + 3 Premium Champagne Included. Includes all GA benefits. 14 VIP tickets. 5 Bottles of Premium Liquor + 4 Premium Champagne Included. Includes all GA benefits. 22 VIP tickets. 3 Magnum Bottles of Dom Perignon Champagne + 3 Magnum Bottles of Belvedere Vodka Included. Includes all GA benefits. 25 VIP tickets. 4 Magnum Bottles of Dom Perignon + 5 Magnum Bottles of Belvedere Vodka Included.